Enter your email address below to receive an email notification when the product comes back in stock. 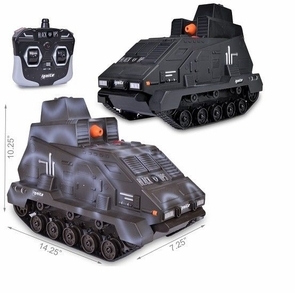 Big sale on full function remote control army tanks with working battle cannon that fires safe plastic shells about 180 fps with a 75 foot range. This ready battle pack comes with 2 trucks, one black and one in tan. Want more? These RC trucks are available in four separate frequencies for the remote controls so you can battle each other. Comes with 4 wheel drive so you can drive on most terrains and the truck reaches speeds of about 15 MPH. This RC tank looks great in special ops black or military tan and working battle cannon from the 320 degree rotating turret is so much fun. Plus, the barrel can elevate up and down. You'll be driving circles around your buddy's tanks while gunning them down with your rotating turret. While you are here take some time to relax and check out all the TrendTimes.com cool toys, remote control helicopters, and the best remote control ride on cars for kids. Order more than 1 RC Battle tank and we will automatically send separate frequencies. Full-function remote control allows you to drive forwards, backwards, left and right. Four wheel drive, high/low gear settings, and full suspension makes this RC battle vehicle very durable. Rotating the cannon turret 320 degrees via the remote control as well as firing with a 300 BB capacity. Plus you can elevate the turret up and down all from the remote control! Maximum firing range of about 80 feet. Includes RC tank, radio, working cannon, and 500 free BB's. We do our best to offer color preference, but color choice cannot always be guaranteed due to high demand. See related categories of RC tanks, RC Hummers, RC trucks, and army toys for sale. I bought this for my grandson to play with. He received it the day of the cruise. I am sure he will love it.